Anyone on Medicare should review their modified adjusted gross income (MAGI) when they file their tax return for 2012 to avoid an unpleasant surprise this fall. 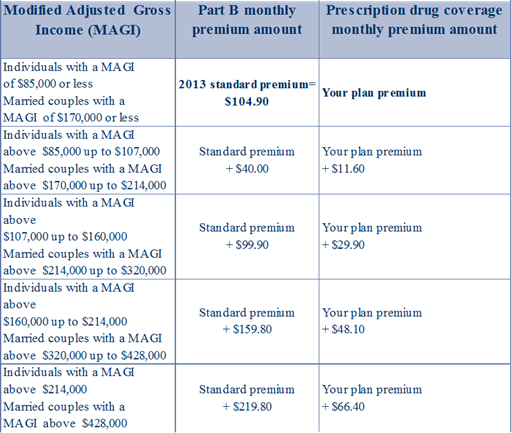 Upper-income beneficiaries pay higher premiums for Part B and prescription drug coverage. This affects less than 5 percent of people with Medicare, but the income levels are not indexed to inflation. Each year, inflation will cause more people to pay the higher premiums. If you also subscribe to Medicare prescription drug coverage, you will pay higher premiums for both. If you have only one—Medicare Part B or Medicare prescription drug coverage—you will pay an income-related monthly adjustment amount only on the benefit you have. If you decide to enroll in the other program later in the same year and you already are paying an income-related monthly adjustment amount, the adjustment will be applied automatically to the other program when you enroll. The premiums are determined year by year. If your income falls below the threshold in 2013, you will pay lower premiums in 2015. Part of tax planning each year should take Medicare premium increases into consideration. Tax loss harvesting, shifting dividends, and interest into tax-deferred accounts and qualified charitable distributions from IRAs are all techniques that can be used to minimize Medicare premiums. Unfortunately, it is too late to do anything about 2014 premiums. Make sure you discuss this with your financial adviser this year to determine what strategies may be appropriate for your situation.